I realized that I hadn’t posted what we did for lighting in the create room. 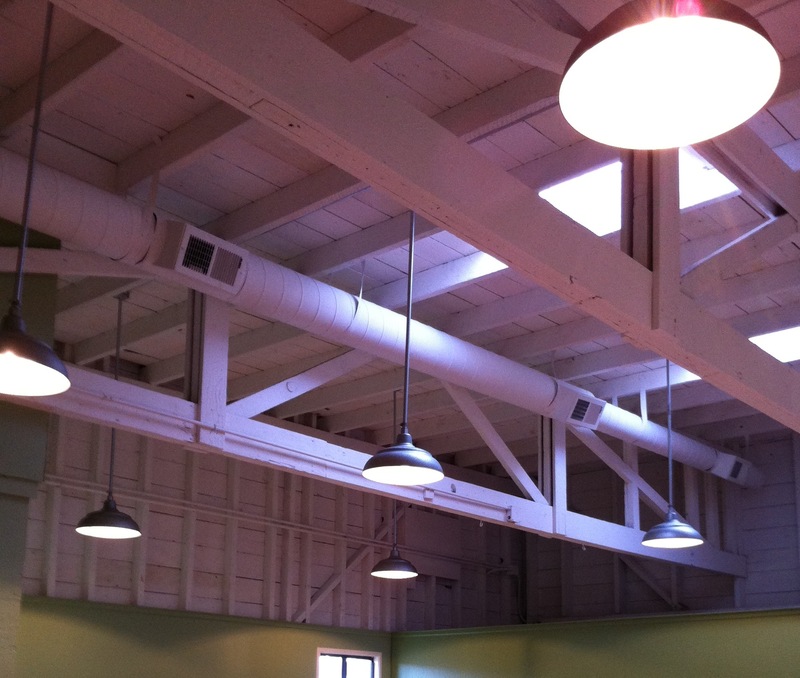 With the 14′ ceilings and the exposed joists, beams, and HVAC, it was an interesting challenge to come up with something that looked “right” while providing the correct illumination for the tasks that will happen in the room. In the end, we chose to install 8 separate lights each dropped 4′ from the ceiling to just below the bottom of the roof joists. The fixture is a standard galvanized steel industrial shade with 100 watt clear halogen bulbs. As you can see from the photo, it turned out nicely. It took some time and effort to get the conduit into the correct positions and connect everything up. I can now recommend without hesitation laser leveling tools. This helped in 2 dimensions, the first was in positioning the drops for the lights on a nice grid. The grid was first laid out on the floor and the laser was then positioned at the right spot on the grid pointed at the ceiling and that’s where the fixture was placed. The second dimension was in making sure all the drops were at the same level from an eye perspective. Since the building is old and not square, just cutting 4′ drops and trusting it to look right didn’t work. So I mounted the laser on a wall at drop level and then used the projected line to align the shade drops at a consistent height above the floor and to themselves. You are currently reading Create Room Lighting at Oddyssea.